Today I'll be reviewing these necklaces from Onecklace. I'm sure you all have seen these necklaces around. I already own the 24k-plated Name necklace, and I'm glad to add these two to my collection! I know the Name necklace looks gold here, but it's only because it reflects my hair color. It's definitely silver. If you don't already know, Onecklace is an international jewelry manufacturer that specializes in making customized jewelry. Each order comes with a Certificate of Authenticity and the pieces are all stamped or embossed with the appropriate metal number. I have chosen two sterling silver pieces so each is stamped with "925;" it's very small so it's not noticeable when worn. 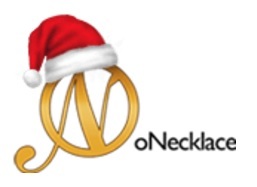 Onecklace offer various lengths for the necklaces and two chain styles. Both of these are 16cm long and are in the rolo chain style. Compared to my previous Name necklace, the clapse are different. I found that the rolo chain & clapse is a lot harder to put together. Here's how the 16cm falls on me. If you have trouble figuring out which length to choose, I would recommend those that are petite (5'2" and under) to get the 16cm and for those that are taller than that to get the 18cm. But of course, you can honestly choose which ever length you prefer! Overall, I love these necklaces! In my opinion, it just feels extra special to have customized jewelry. Also, you don't necessarily have to get a necklace with your name, you can have any word you like. Onecklace has other types of jewelry to customize as well such as earrings, bracelets, and rings if necklaces aren't your forte. And of course I have a discount for you all! Use [ uhhsandy10 ] and you get 10% off your entire order. This would be good for those with more unique names who can't ever find them in stores. But what would I know about that. I have a very generic and popular American name. My mom made sure of that.